Is Joanna Gaines the oracle of home design? Many of the kitchen and bath trends that industry experts believe are destined for greatness in 2018 can be seen on her popular HGTV show, "Fixer Upper." The most popular kitchen design of the year will be farmhouse, according to the National Kitchen and Bath Association's annual trends report. It's marked by the use of barn doors, painted cabinets, shiplap wood paneling, and mixed metals throughout. Sound familiar? The report is based on interviews with more than 800 U.S. and Canadian industry designers, remodelers, architects, dealers, and manufacturers. "Farmhouse is becoming popular because of what we’re seeing on television,” says Elle H-Millard, industry relations manager at the association. Transitional-style kitchens, a blend of contemporary and traditional with arched doorways and simple lines, and contemporary-style kitchens, which have all clean lines, sharp angles, and open shelving, are also fashionable at the moment. For bathrooms, the most popular style was transitional. The look features wood cabinets, painted walls, brushed-nickel fixtures, and a color palette of white, gray, and blue. Contemporary, which has quartz countertops, free-standing bathtubs, and curbless showers, came in second, followed by more traditional bathrooms. The home kitchen and bathroom market is expected to grow 9.3% in 2018, to hit about $179 billion. The bulk of that, nearly two-thirds, is likely to be in remodels instead of new construction. That's likely because a lot of people are opting to improve the home they have rather than trade up. The survey was of nearly 200 builders, remodelers, and general contractors. The spending included is just on products and does not include labor and construction costs. When it comes to kitchens, homeowners are very particular about what they do—and do not—want. Painted cabinets top wooden and glass ones, ceramic or porcelain backsplashes reign supreme, and hardwood floors are all the rage. For countertops, "quartz is where it’s at right now,” H-Millard says. See ya, granite! Homeowners also continue to love white, off-white, and gray colors. And "we’re seeing a big rise in barn door applications," she adds. Folks are just as choosy about their bathrooms. They overwhelmingly want quartz countertops, wooden cabinets, and porcelain or tile floors. They also prefer painted walls to tiles and white, off-white, and gray color schemes rather than blues. What kitchen and bath features are people spending the most money on? In kitchens, builders and homeowners dropped the most cash on cabinets, at $17.8 billion; appliances, at $17.5 billion; countertops, at $13.4 billion; flooring, at $12.1 billion; and sinks, at $4.4 billion in 2016, according to the most recent data available from the association. About three-quarters of the money spent on kitchens is in remodels—instead of newly built homes. The median cost of remodeling a medium-size kitchen was $47,500, according to the report. When it comes to bathrooms, folks spent the most on showers, at $11 billion; flooring, at $10.8 billion; vanities, at $9.5 billion; bathtubs, at $9.1 billion; and countertops, at $8 billion in 2016, according to the association. The money was roughly split between remodels and new construction. The median cost to remodel a master bathroom was about $35,000, while a second bathroom remodel was about $15,000, according to the report. There are a few kitchen and bath trends to watch. Rose gold and white or simple gold and white color combos are gaining traction among homeowners. 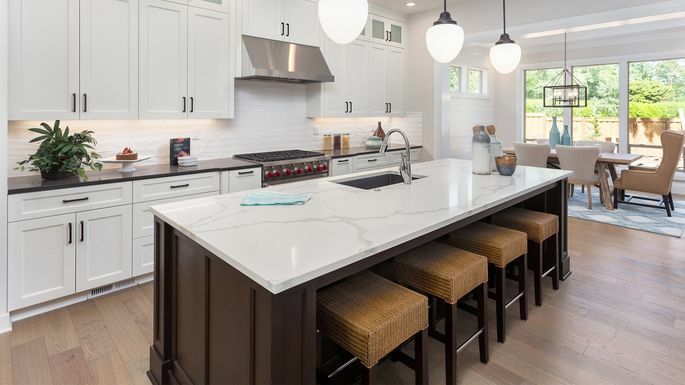 Home cooks are opting for induction and steam cooking over gas stoves and ovens, and folks are adding more bright pops of color into their kitchens, accented with white. H-Millard’s also seeing some pushback against the "open everything" concept, with some private spaces showing up in otherwise open kitchens. Island prep stations are now being installed with built-in sinks. "And we’re seeing custom everything” as homeowners put their unique stamp on their abodes, she says. For bathrooms, the use of natural stone is on the rise. "Designers are really finding natural stone as a true piece of art," H-Millard says. Digitally controlled smart toilets (no, we're not kidding), steam showers, and barn doors are also becoming more popular.